As some of you know, I’m writing a book about the Kearny Cross: a medal which was awarded by Union General David B. Birney (and named in memory of his predecessor) to members of the First Division, Third Corps, Army of the Potomac. There were two versions of the medal: the “Kearny Medal of Honor” for officers and the “Kearny Cross of Valor” for enlisted men. They’re often referred to collectively as the “Kearny Cross.” Although they were actively awarded over the course of at least two years (Dec ’62-Dec-’64), the only published list of recipients of the Kearny Cross was issued by Gen. Birney in the form of General Order #48 following the Battle of Chancellorsville in early May, 1863. That order identified 454 “meritorious and distinguished non-commissioned officers and privates, selected for their gallantry” and lists the recipients by name. An unusual characteristic of this order is that it included two women – volunteer field nurses or “vivandiers” named Anna Etheridge and Mary Tepe who were noted for their bravery because they went onto the battlefield to tend to the wounded of both sides, even as bullets flew all around them. But my research has uncovered at least two more women who received this medal. I thought that I would relate the story of my efforts to track one of these previously-unknown female recipients of the Kearny Cross. I’m wary of any new source, however, and had not found any previous reference to Charlotte E. McKay as a recipient of the medal. I also know of several instances where a soldier claimed years later to have received a “Kearny Cross” but it turned out to be another kind of medal or even a souvenir badge or replica purchased from a sutler. So I decided to dig a little deeper into Charlotte’s story. With the wonders of online search engines, it didn’t take long to find Charlotte’s tombstone in San Diego, California, giving her lifespan as 1818-1894. A few minutes later, I found Charlotte’s record in the 1860 Federal Census which showed her living alone with her then-5-year-old daughter, Julia L. McKay. With a little persistence, I was even able to find a copy of the last will and testament of “Charlotte Elizabeth McKay” among the Massachusetts State Probate Records. In it, she named her deceased husband as William P. McKay. Most interestingly, she made a point in her will to bequeath to a nephew “my gold chain watch and my cavalry medal.” The Kearny Cross wasn’t a “cavalry medal” but you’ll recall that the book quoted above claimed that it and an “elegant gold badge and chain” were given to her by her patients at the Cavalry Corps Hospital – so it makes sense that Charlotte would refer to the medal as a “cavalry medal.” But it still wasn’t necessarily a Kearny Cross. I thought it was odd that the book didn’t name the brother or his regiment. If I could resolve those details, I thought, it would help to convince me that the source was also reliable when it identified Charlotte’s medal as a Kearny Cross. Back to her last will and testament, I find that she referred to two living brothers – “J. S. Johnson” and “F. A. Johnson” – and two deceased ones – “T. S. Johnson” and “H. Johnson.” The soldier wasn’t necessarily one of the latter two (i.e., she may have had other dead brothers who were not mentioned in the will) but clearly, her maiden name was Johnson. Now I had a surname and a regiment! I happened to have the 1863 Adjutant General’s Report from the State of Maine on my bookshelf so I hurriedly flipped through the list of men in the 7th Maine Infantry looking for a soldier named “Johnson.” You can imagine my disappointment when I found that there were only two and they had both survived the war. Shucks! If the story about the brother was wrong, then maybe my initial source’s description of her medal as a “Kearny Cross” couldn’t be trusted either. The Latin inscription translates to “It is sweet and glorious to die for one’s country” which is the correct inscription for an authentic Kearny Medal (the officers’ version)! The book goes on: “Early in January, 1863, she was, after much difficulty, furnished with a pass which admitted her within the army lines at Falmouth, where the army was encamped. She spent several days in visiting her brother and other friends in the Seventeenth Maine volunteers” So her brother was in the 17th (not 7th!) Maine Infantry. It is worth noting that an enlisted man would not likely be bunked in the same tent as a “Captain F.” Charlotte’s brother was almost certainly an officer. “Oh, Dudley,” I cried out, “I’ve been looking for you, buddy!” The tent-mate was Captain Almon A. Fogg and their fates described in the right-hand column were a perfect match. But as exciting as that was, the connection between Charlotte and this Dudley H. Johnson was still just a theory. I needed to prove a direct connection between them. But then I noticed that Dudley’s marital status is given as “M.” While Dudley didn’t survive to collect a pension, maybe his wife did! Oh so conveniently, Fold3.com includes full digital copies of Civil War widows’ pension files online. 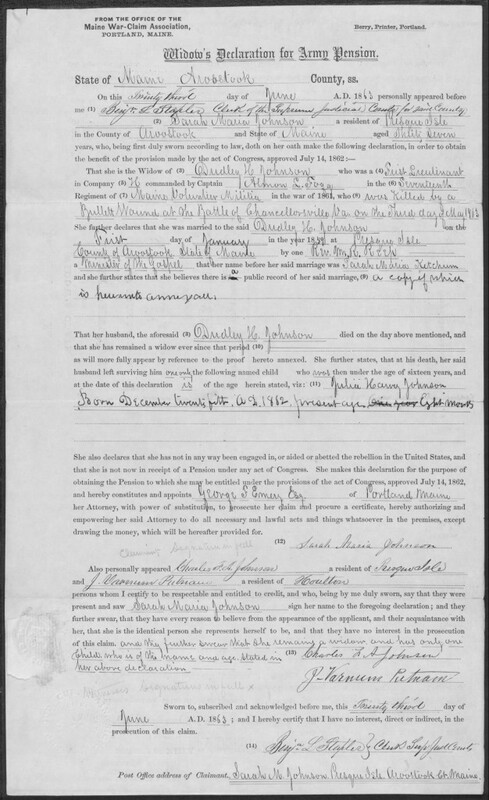 And sure enough, on 23 June 1863, a Sarah Marie Johnson filed for an army pension citing the service of her deceased husband, First Lieutenant Dudley H. Johnson, Company H, 17th Maine Infantry who “was killed by a bullet wound at the Battle of Chancellorsville on the third day of May, 1863.” The pension was granted with minimal paperwork. Ten years later, however, Sarah applied for an increase to the pension amount. In the interim, she had moved to New Brunswick, Canada – a decision which greatly complicated the matter. Suspicious government investigators insisted that, unless she could prove that the dead soldier had been a U.S. citizen, Sarah might lose her pension altogether. What followed was a flurry of correspondence and affidavits as Sarah tried desperately to justify her pension. I’m sure that it was a time of great stress for poor Sarah – but it was a blessing for me. And so the circle of evidence is complete and I think that Charlotte can join the very short list of women who received a medal for bravery during the U.S. Civil War. Now if only I could find a photograph of her! The only official published list includes 454 recipients of the Kearny Cross. But so far, my research has identified 804 recipients, culled from hundreds of sources, including regimental histories, diaries, newspaper accounts, unpublished manuscripts, and obituaries, among others. In addition to a comprehensive list, I hope in my book to present a short biography in tribute to each recipient. 1 down, 803 to go.